President Donald Trump speaks in the Rose Garden of the White House in Washington, after a meeting with Congressional leaders on border security on Friday, Jan. 4, 2019, as Homeland Security Secretary Kirstjen Nielsen, Vice President Mike Pence, House Minority Whip Steve Scalise of La., and House Minority Leader Kevin McCarthy of Calif., listen. On the eve of President Donald Trump’s prime-time address to the nation Tuesday night about border security, Vice President Mike Pence asserted that congressional Democrats are unwilling to negotiate. After weekend talks, senior Democratic congressional staffers agreed with Trump administration officials that a crisis exists at the southern border, but weren’t ready to negotiate a plan to address it, Pence said Monday. “Senior Democratic staff did not dispute our facts about the border,” Pence told reporters at a briefing in the Eisenhower Executive Office Building, held in the same conference room where the weekend talks occurred. Trump is trying to reach an agreement with congressional Democrats to gain funding for a wall along the southern border and end the partial government shutdown that began Dec. 22. Trump announced Monday that he will deliver the address to the nation at 9 p.m. Tuesday, then visit the border Thursday. Democrats asked the administration for revised budget estimates based on Trump’s requests for increased border security. The biggest request from Trump in the revision is $5.7 billion for construction of a steel border wall, a $4.1 billion increase from the Senate-passed bill in December designed to keep the government running. 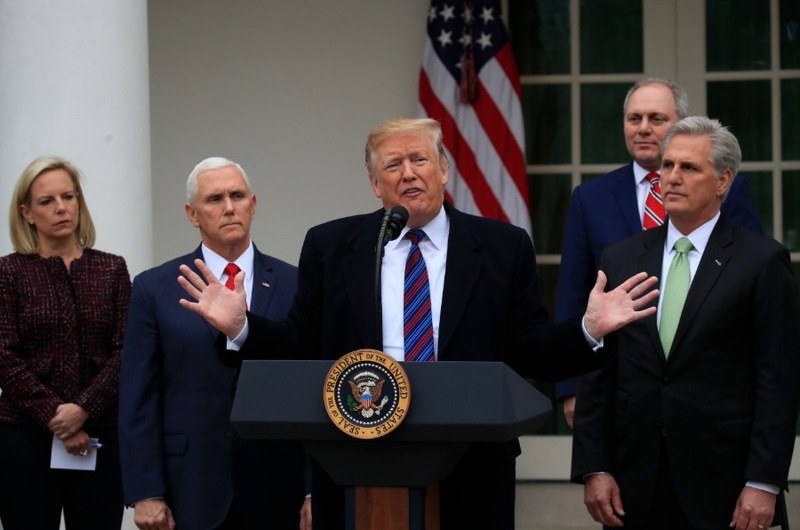 Pence got multiple questions about Trump’s comment Friday that he has considered declaring a national emergency to build and pay for the wall. The vice president said he hopes it doesn’t come to that, adding that he believes Democrats care about border security. Many Democrats voted in 2006 to build fencing or another barrier along the border, but the needed money never has been appropriated. Congress has funded most of the government. The current shutdown affects only about 25 percent of the government, including the departments of Agriculture, Commerce, Justice, Homeland Security, State, and Transportation. Pence said he sympathizes with the 800,000 federal employees affected by the partial shutdown, but also with “tens of millions of Americans” who expect the government to provide stronger border security. The vice president also said Trump made a “good faith offer” to Democrats on the day the shutdown began to keep the government open. Pence declined to provide specifics. The administration is working to make the partial shutdown “as painless as possible consistent with the law,” said Russell Vought, deputy director of the Office of Management and Budget. Vought said the National Park Service will have the money to ensure trash pickup and clean restrooms through the end of the month, and that the IRS will mail out tax refund checks on time. The administration’s revised budget estimate for fiscal year 2019 also includes a $563 million request for 75 additional immigration judges — consistent with what the Senate passed in its bill to keep the government running. The administration asks for $211 million in the revised request to hire 750 more Customs and Border Protection agents—an increase of $100 million over the Senate version. Trump also wants $571 million for 2,000 Immigration and Customs Enforcement personnel, which was not included in the Senate bill, and $4.2 billion to pay for 52,000 ICE detention beds — a $798 million increase from the Senate bill. Pence identified two areas in the revised budget request as “consensus items” where congressional Democrats agree with the administration. One is Trump’s request for $800 million to address humanitarian needs at the border, including medical support, temporary facilities for processing, and short-term custody of vulnerable populations. The agreement includes in-country processing of asylum requests by unaccompanied minors. The other item of agreement is spending $675 million on technology designed to allow Customs and Border Protection to “detect and deter” contraband such as drugs and guns and materials that pose nuclear and radiological threats. Pence said the administration’s stand “isn’t about” pleasing the president’s voter base but about border security, because the president is “driven by the facts” at the border. Many of the facts are included in a Department of Homeland Security report that DHS Secretary Kirstjen Nielsen initially provided to Congress before talking about Monday with reporters at the briefing. The DHS report says the solutions are finishing the border wall, updating the law on how to treat unaccompanied children, and reversing the Clinton-era “Flores settlement” that required officials to separate some children from adults in family units. The numbers show a 73 percent increase in fentanyl, one of the deadliest drugs, at the southern border from fiscal 2017 to fiscal 2018. That amounts to 2,400 pounds. The agency also reports a 38 percent increase in methamphetamine at the southern border over the last fiscal year, and a 38 percent increase in heroin. Customs and Border Protection rescues about 4,300 migrants in distress each year, according to the report, which also says that 31 percent of female migrants say they were sexually assaulted on the journey to the U.S.